Connectors used in medical electronics must be reliable. Hospital efficiency depends on it, but much more importantly, so do lives. 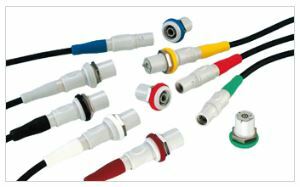 Interconnect solutions in medical devices need to be able to withstand a variety of chemicals and body fluids, withstand shock and vibration, offer EMI and RFI protection, and continue to perform as specified after many mating cycles. This white paper will educate you on the key issues you should consider when selecting connectors for use in medical devices and provide information on a potential interconnect solution for your next electronic device design.